This video covers the very basics on finger style picking. Something else to consider in finger style playing is whether or not to grow the fingernails on your right hand. I have grown them in the past and really loved the sound and extra volume I could get from minimum effort when finger-picking classical guitar. However, they do compromise other aspects of guitar playing and various other tasks your hands may be needed for throughout the day. Fretboard tapping for instance, which is a technique I use often on the electric guitar, is much harder when you have long fingernails on your right hand getting in the way. Playing the piano, another of my instrumental pursuits, is pretty uncomfortable when you have nails too. If you feel acoustic fingerpicking is the thing you love most, above all other aspects of guitar playing, then you should at some point try growing your nails to see how you like the sound and feel by comparison. You can also consider having strong acrylic nails applied to your right hand if your natural nails turn out to be too brittle. 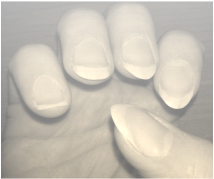 Nails can transform your acoustic sound from being muffled and dull (especially the thumb) to very bright and clear. They can also greatly reduce the workload on your picking hand. They generally make it easier to play fast passages, especially with multiple notes on the same string, and the note separation will usually be clearer. Certain finger style techniques, such as ‘tremolo picking’ are extremely difficult to execute convincingly with flesh instead of fingernails. There really is no substitute in my own experience, but there are others who feel differently, like this chap for instance, who's technique sounds exquisite without nails. There are other exceptions to all of this of course, so players like Tommy Emmanuel do exist for instance, who gets by spectacularly well with callused flesh on the picking hand rather than nails. At the end of the day, it’s you who will make the right choice for the stylistic directions you’ll take, but I’m obligated inform my students of all their options, and the merits of some vs others.